Repair Center for Samsung Galaxy - Expert Galaxy S Repair Technicians. Galaxy Screen & Battery Replacement, Water Damage Repair & Data Recovery. Sweet Memory offers a full range of Samsung Galaxy Phone Repairs, Services, and Galaxy Accessories. Our Expert Repair technicians, service a wide array of Samsung Galaxy models: Galaxy S9+, Galaxy S9, Galaxy S8+, Galaxy S8, Galaxy S7 edge, Galaxy S7, Galaxy S6 edge, Galaxy S6, Galaxy S5. 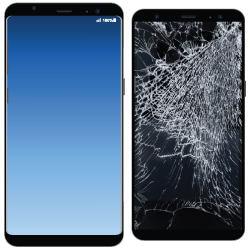 We repair or replace glass screens, screens & LCD's, charging ports, and batteries, repair water damage and perform data recovery in Downtown San Francisco. We use highest quality Grade "A" Manufacturer standard replacement parts with a 90 day limited repair warranty at a cost-savings. We are responsive, careful, offer quick turnaround times and have a proven track record of high customer satisfaction. Highly Rated - Sweet Memory Computer & Samsung Galaxy Repair. Highest Quality - Grade "A" Manufacturer Standard Replacement Parts Galaxy S Repair Screen Screen & LCD Charging Port Battery Replace Galaxy S9+ $379.99 $379.99 $89.99 $79.99 Galaxy S9 $339.99 $339.99 $89.99 $79.99 Galaxy Note9 $419.99 $419.99 $89.99 $79.99 Galaxy S8+ $349.99 $349.99 $89.99 $79.99 Galaxy S8 $329.99 $329.99 $89.99 $79.99 Galaxy Note8 $369.99 $369.99 $89.99 $79.99 Galaxy S7 edge $279.99 $279.99 $89.99 $79.99 Galaxy S7 $229.99 $229.99 $89.99 $79.99 Galaxy S6 edge $179.99 $179.99 $89.99 $79.99 Galaxy S6 $169.99 $169.99 $89.99 $79.99 *Repair Special pricing, no other offers or coupons apply. Sonali : What an incredible experience. I have an unfortunate proclivity for ruining my iPhones. Sweet Memory has been there every single time for me -- with incredible service, top-notch professionalism, and outstanding technical support. I wouldn't consider going anywhere else. Leann : There's nothing worse than dropping your phone and seeing your beautiful little screen shatter to pieces. This time I am blaming my dog. Sweet Memory repaired my phone in no time and at a fair price. Thank you.